Every once in awhile there comes along a completely simple kitchen tip that revolutionizes the way one makes meals. For the past year, I think I have told all my friends about this tip, but I realized that I never shared it here. I think you need to sit down for this because it’s just that good. We all know what a pain it is to shred chicken. I love to grill chicken in bulk, as well as bake chicken and turkey in bulk, freeze it, and then use it for Ten Minute Dinners throughout the month. The one draw back is the fact that the cutting and shredding always takes so much time. Well, no longer. 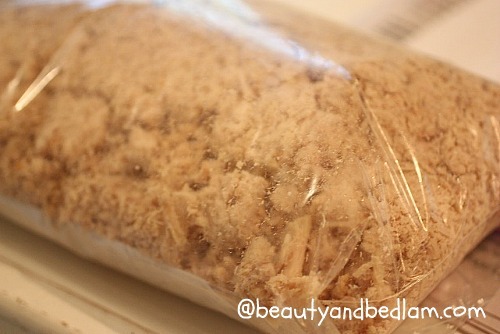 This simple tip shows you how to shred chicken in seconds and this picture tells it all. which is my most recommended kitchen tool). Turn the machine on low, and let the paddle do its magic. 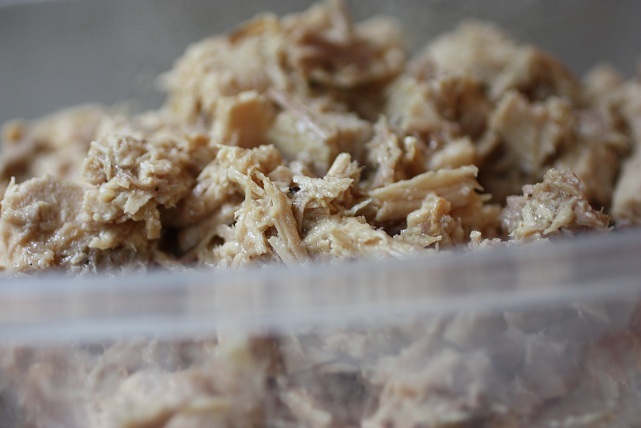 Ten seconds later – perfectly shredded chicken. If you want it really fine for casseroles or soups, just give the paddle a whirl for a few more seconds. I know. Crazy easy, right? Isn’t that the best? Two days after Thanksgiving, I purchased an organic, fresh turkey marked down ridiculously low. Well, I cooked that up for my family, but a 22 pounder can’t even be eaten by my big eaters. I had SO much meat, I wasn’t sure how to tackle it. I literally filled up my Kitchen Aid with huge hunks of turkey. I wasn’t sure how it would work on such large pieces of meat, since previously, I have only done this with chicken, but again, it was a work of art. In only a few minutes, I had shred pounds and pounds of turkey, and filled four gallon sized Ziplock bags full so that I could use it for future meals. Share this tips with your friends. It’s the little things, like this simple tip that makes meals in minutes a reality. What an awesome tip! Definitely need to Pin this one! Thanks so much for sharing!! So sad this does not help those of us who do not have a mixer 🙁 time to save for one. Patricia Taveras – yes, something to save for. You can check Craig’s List. I’ve seen KA’s on there or around Christmas, there are always amazing deals on mixers. Is the paddle a standard part of a stand mixer or is that an accessory that is purchased separately? That is the standard part. It’s the main mixer for the Kitchen Aid, so I am sure that beaters might work as well. I don’t have a kitchen-aid, it’s best on my wish list for too long. I wonder if this would work at all with my regular mixer???? 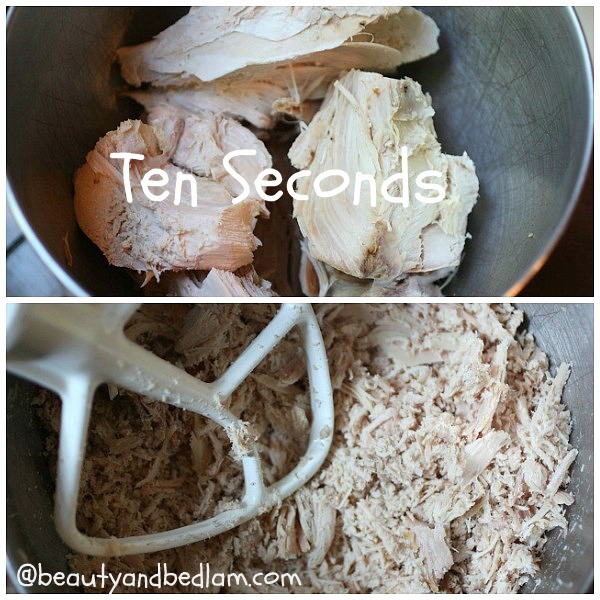 Just tried shredding my chicken for the first time in my mixer- -Wish I had known this tip years ago! It worked great! Thanks for sharing! YAY!! I know. I felt the same way thinking of all the years I chopped and shredded. Thank you! This is a wonderful tip and I can’t wait to try it. Yet another reason to love my Kitchen Aid! Sheer brilliance…no wait…perfection…disguised as a kitchen hint!!! I absolutely love this idea, and can’t say enough about it! I don’t have a mixer, but I do have a food processor – do you think that would work, or would it end up chopping the chicken too fine? I bet it would work if you just pulsed it on low speed as opposed to high continuous speed. Does that makes sense? @Jen, That makes perfect sense! 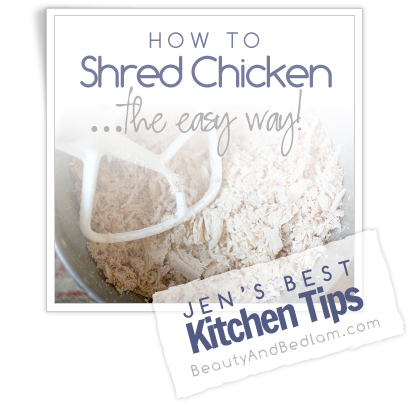 I’ll have to try that out – shredding chicken is one of my least favorite things to do. This is probably a dumb question, but I assume it won’t work on uncooked chicken? I ask because I have a recipe that requires shredded chicken BEFORE you cook it. Oh how I hate it! Oh, that is a bummer. I can’t imagine it working on uncooked chicken because it’s so much harder than when cooked. If you have a food processor, i would recommend that. I am almost speechless. This will change.my.life. [And you need to mention this the next time you speak at MOPS]!! I’m so glad I was sitting when I read this!! I was lamenting the fact that I don’t have a mixer for this fantastic tip (I have a food processor, but it purees the heck out of the chicken – not the texture I was going for), but I realized that this would *probably* work with my hand mixer. I have an attachment that looks like the white thing above (not a very technical term….sorry!). What do you think? Possible? Thanks for this tip, either way! @Steph @ MomKaboodle, Instead of using the blade, do you have a plastic blade that came with your processor. The one I have is suppose to be for kneading dough, maybe that would not puree the meat. Just a suggestion. Just wanted to let you know that it also works with pork. (Not sure why I was surprised. It IS the other white meat after all 🙂 !) I put a huge pork roast (bought on short sale) in the crock pot. The Kitchen Aid tackled the shredding. Pulled pork, anyone?? Thanks for the fantastic tip. Woo-hoo!! Fighting bronchitis and asthma a couple days before Christmas, I had to find an effortless way to shred chicken without worsening my asthma, because Christmas waits for no one and the show must go on. This ingenious method is just what I needed. Thank you so much! This is an amazing tip; thank you so much! I’ve done this twice already, very successfully, and this has cut down my shredding time by like, an hour. 😉 My friends were all also amazed when they saw me do it! Oh, and I should also add that I did this in my little Hamilton Beach stand mixer rather than a KitchenAid, and it still worked beautifully!